As the gospel of Christ crucified cannot be attained through the religious works of sinful men, nor can be attained through the logical thinking of sinful men, neither can it be more effective, more persuasive or more savingly executed through the eloquent proclamation of sinful men. When we can boast in anything apart from the redeeming work of Jesus Christ, by His righteous life lived, His prophetic word taught, His heavenly declarations proclaimed, His obedient servitude exemplified, His perfect substitutionary death, etc., we sin, straying from the gospel, departing from its glory and its power. And wisdom from on high. The lofty He laid waste. 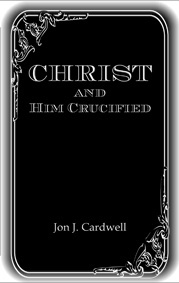 Jon Cardwell, Christ and Him Crucified [Anniston: Vayahiy Press, 2011], 56-58.